I was at a dinner hosted by Mathew Holt and Health 2.0 in June of 2010, when I met Alexandra Drane. She was seated near me. I first saw her from behind. She was a slight woman in a light jacket. Her hair was long with sun kissed streaks. Matthew introduced us and as she spun around I was stunned by the presence of Alex. She was full of vitality and light. Within moments of meeting she told me about her company and her causes. Alexandra founded Eliza. Eliza is a company that uses computer technology and voice recognition software to help people to remember to take their meds and to schedule important medical appointments. She also told me the story of her sister-in-law Za. Za was diagnosed with cancer at the age of 32. She died 7 months later. She spent the last two months of her life in the hospital. She did not want to die hospitalized. Alex spent months fighting the system to try to get Za the best care. In the end, Za’s brother fought the hospital to help Za go home so she could spend her final days with her two-year-old daughter. Finally, Za got to go home and hold her daughter before she died. After this experience Alex, created Engage with Grace. It was a simple concept that involved asking important questions on a power-point slide. What if we showed one slide at conferences that asked five different questions about our end-of-life desires? What if we all took time to ask these questions to our friends and family? Could we have a better experience at the end of our lives? The next day was Health 2.0 goes to Washington and I had a chance to see Alex speak. She was a dynamic speaker and she did a wonderful presentation of Eliza. I had a chance to talk with her that day and she said at some point she would like to commission a painting. We parted ways and time passed before I would see Alex again. 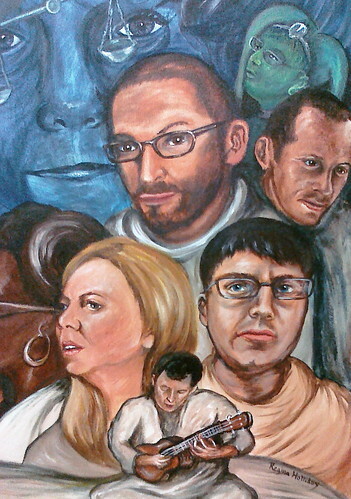 In October of 2010, I saw Alex at Health 2.0. She would tell me, once again, that she would like a painting. Perhaps a jacket like her friend Roni Zeiger had commissioned, or perhaps a painting for her father. 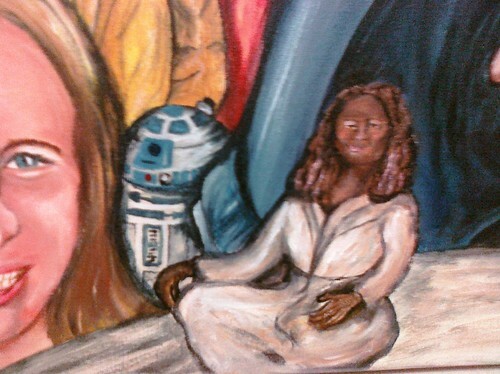 We parted ways and agreed I would soon paint for her. 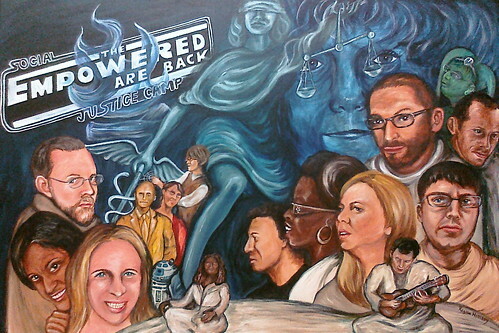 While attending Health Camp DC in November, Alex was emailing me about the painting. I answered her questions while listening to an unconference presentation. I was seated near two Eliza employees. I switched sessions and as the talk turned to drug compliance, I noticed that no one in my session mentioned the benefits of Eliza. I asked “Where are the Eliza folks?” And I as texted about the power of medical paintings with Alex, I spoke of the power of Eliza before a diverse group of medical professionals. Soon one of the Eliza staff came in and took over describing the system, and Alex told me the painting would be for her Father. Later in November, Alex called me to describe her father. I was on jury duty at the time. During our short lunch recess, I stayed in the deliberation room and spoke with Alex about her father Douglas Drane. She described him as a loving, caring and energetic man devoted to many elements of alternative medicine… and he loved Dragons. Then the idea came to me, it would not be one painting, it would be two. This would be a juxtaposition piece that focused on balance. This is “West meets East.” It consists of two 18x24 canvases. The background field is a deep bluish purple. Within this field, swirls of white form an infinity loop. The left canvas focuses on elements in Western medicine, so the swirls of white on this side are suffused with pills and tablets. These are the drugs that can save a life or prolong it. 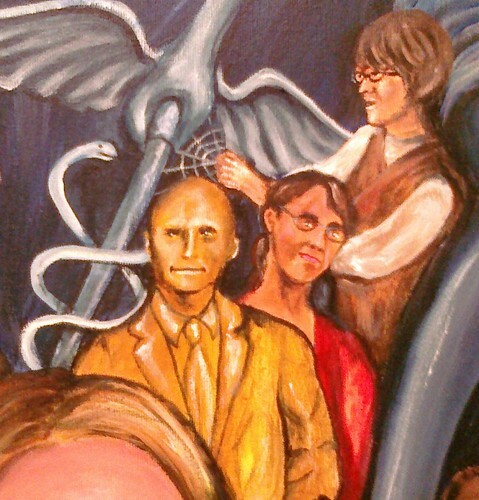 A doctor looms over the patient in this scene. A look of concern is on his face as he provides chest compressions to our unconscious patient. He is trying desperately to save a life. 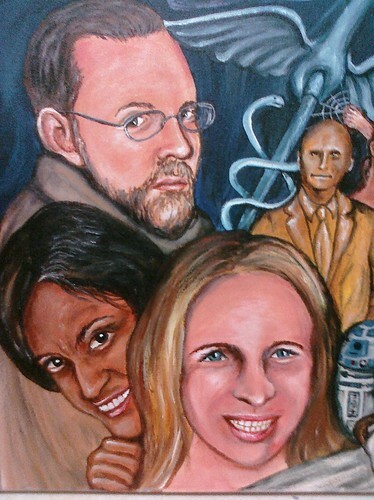 The top half of the Doctors head is cut off in the frame. Is this case of a poorly framed shot? Or is this mechanical response on the part of the medical professional? Is this action without thought? The patient lays with her head dangling and her face serene. Her breasts are gone and are replaced with a heart shaped cavity in her chest. 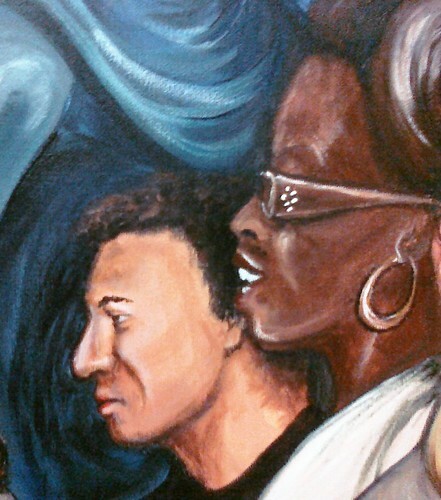 A stylized version of Alex Drane stares out at the viewer to the right of the doctor. Her hand is twisted and placed with the heart shaped cavity. Protruding from the skin of Alex’s arm is a child’s slide. Here is the One Slide Project. Here are the end-of-life questions that you should share with your family. Does this patient want to be brought back? Is this what she wanted at the end of her life? 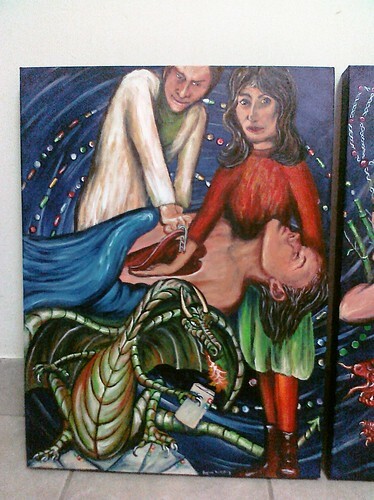 The patient’s body is supported by a western-style dragon. This dragon is reptilian and cold. It is green and blue. It is the color of money. It stands inside its lair; the hoarded loot within its claws are files upon files of medical records. Each record says EMR, EMR, EMR; and this dragon does not want to share its treasure. It is breathing a small tongue of flame preparing to destroy all that it cannot keep as its own. In the right canvas the infinity swirls flow into an Australian aboriginal dot motif. This is dream time. This is where the soul meets the body. A massage therapist stands above our patient and rubs her back. She is serene and calm. 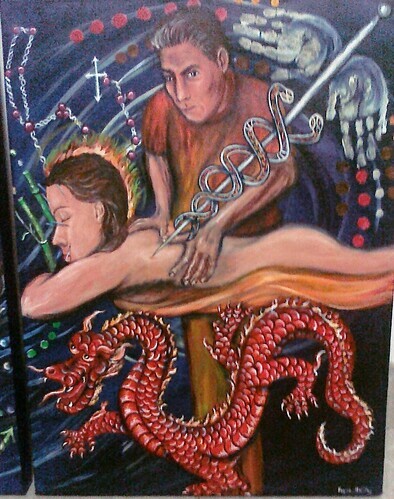 Acupuncture needles are arrayed upon her face and an elongated needle upon her back forms a stylized caduceus. The wings of the caduceus are formed by the handprints of a child. The caduceus represents medicine, but also warns against false treatment. For not all alternative therapies are helpful, and some programs are more about thievery and profits, then health and healing. Our patient’s head is surrounded by a strong aura. Above this aura a Rosary is superimposed on the infinite sky. Is it Rosary beads and a Cross? Or is Orion and a compass rose? Where does faith reside within medicine and must it be disguised? Beside our patient’s face a bamboo shoot heroically grows out of our infinite swirls. Where is nature within medicine and how can green and growing things soothe the soul? This patient is supported by an eastern-style dragon. He is the red of fire, energy and passion. This dragon does not need to breathe flame, for he is flame itself. He is staring at his western counterpart with concern. He has no wish to destroy but desires to work in concert with the west. 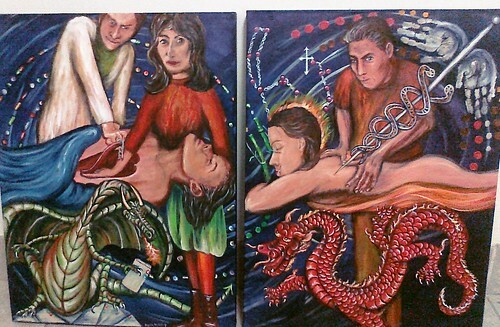 These two paintings are meant to be shown together, for they are about balance. Patients will get the best care when we embrace the treatment path that is best for each patient. That means asking questions, answering questions and sharing information. Neither side is better than the other, but each part makes the whole.